5 Things To Know About Obama's Nominee For Health Secretary : It's All Politics Sylvia Mathews Burwell, the president's pick to replace retiring HHS Secretary Kathleen Sebelius, has small-town roots and big-time government experience. 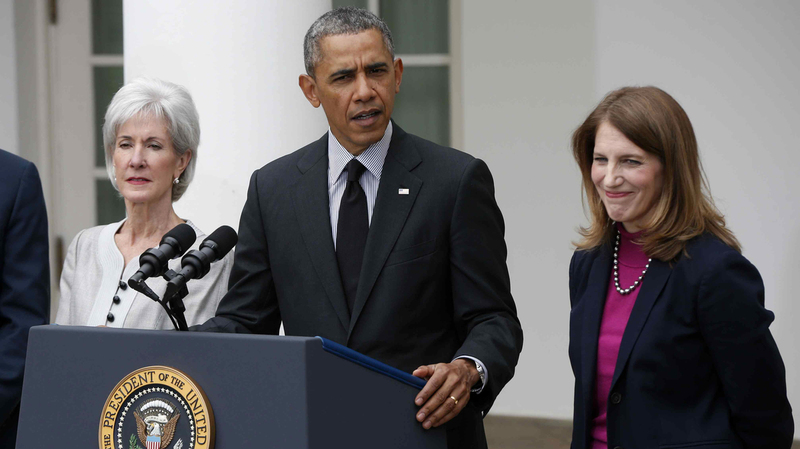 President Obama, flanked by outgoing Health and Human Services Secretary Kathleen Sebelius (left) and his nominee to be her replacement, Budget Director Sylvia Mathews Burwell, speaks in the Rose Garden of the White House Friday. On the same day the White House formally announced the resignation of Kathleen Sebelius as secretary of health and human services, President Obama also nominated her successor: Sylvia Mathews Burwell. 1. She's the current director of the Office of Management and Budget. Burwell heads the agency responsible for preparing and managing the budget for the president and overseeing the performance of other federal agencies. She hasn't held the White House budget director's job for very long — she was confirmed last April. 2. She's a Clinton administration alumna. Burwell served in a variety of positions within the Clinton White House, starting in 1993 as staff director of the National Economic Council when Robert Rubin — Clinton's economic adviser at the time — was its director. She then served as Rubin's chief of staff from 1995 to 1997 while he was secretary of the Treasury. Later, Burwell returned to the White House to serve as a deputy chief of staff until 1998 and then as OMB deputy director until 2001. 3. She has a background in the nonprofit world. Between her stints with the Clinton and Obama administrations, Burwell spent time with philanthropic organizations. She worked for the Bill & Melinda Gates Foundation for 10 years — as executive vice president from 2001 to 2002, as chief operating officer from 2002 to 2006, and as president of the Global Development Program from 2006 to 2011. She then served as president of the Wal-Mart Foundation. 4. She hails from a small town. Burwell was born and raised in Hinton, W.Va., where her mother served as mayor. Burwell's nomination was front page news in the state capital Friday; Democratic Sen. Joe Manchin also hailed her ascent. "I am so pleased that Sylvia Mathews Burwell, a native West Virginian and current Director of the Office of Management and Budget, has been nominated as the next Secretary for the Department of Health and Human Services," Manchin said in a statement. "Sylvia's experience in both the public and private sector, matched with the bipartisan relationships she has built over the years, shows that she is a public servant ready to take on this country's challenges." 5. She's likely to face some GOP resistance during her confirmation process. In April 2013, Burwell was confirmed as budget director by a unanimous Senate vote. House Budget Committee Chairman Paul Ryan praised her nomination at the time, saying she had "firsthand experience in budgeting responsibly." But in her new position, she will face pressure from Republicans who oppose the health care law she is responsible for implementing. And her confirmation hearing will very likely be an opportunity for Republican senators to criticize the Affordable Care Act.